Weasel foam flying wing flying from earth dam. 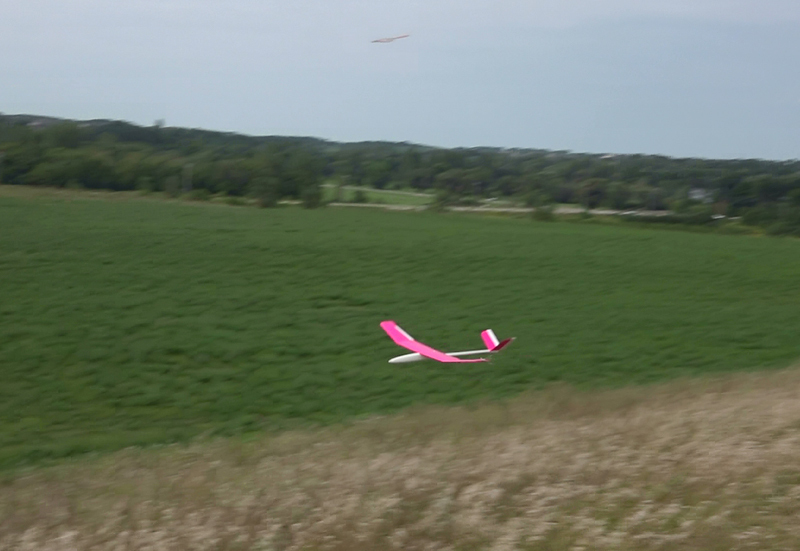 Like in the video, my first attempts at flying from a small slope was with a 60” hand launch glider. 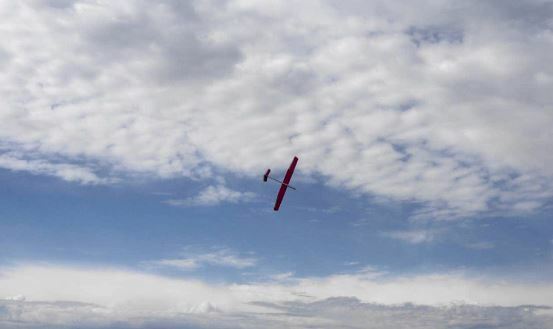 It became apparent on the smaller slopes, the lighter the wing loading and the lower the drag the better the chance the glider would stay aloft for a minute or more. I remember flying the Secret (that was the glider’s name) hand launch which was state of the art in hand launch at the time off a big dirt mound. Flights were pretty short but it was staying aloft from slope lift. 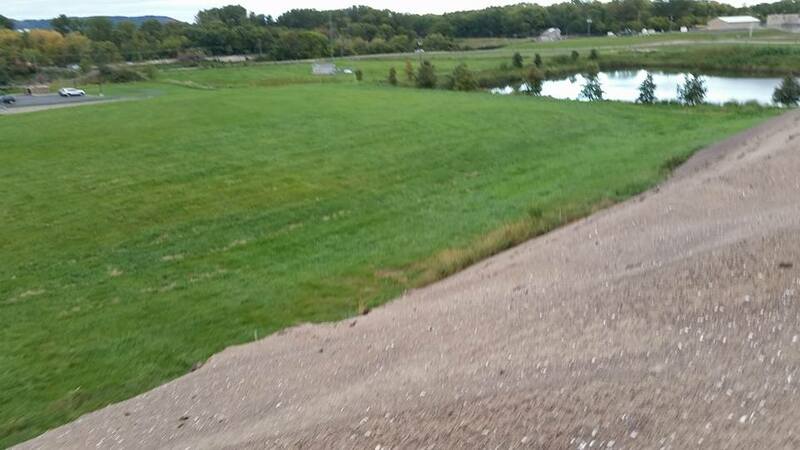 It became apparent that if the wind were to diminish or shift direction from straight into the slope, the glider would come down quickly on a small slope. Flying from the small slopes it became quickly apparent the need for smooth flying, finding the areas of greatest lift and climbing when you can. The lift band is very small and you must work hard to keep your glider flying in this area at all times. It is really critical that the wind is blowing into the slope straight as any variation will not provide enough lift to keep your glider aloft. At times the glider will be flying very close to the slope trying to utilize the lift. 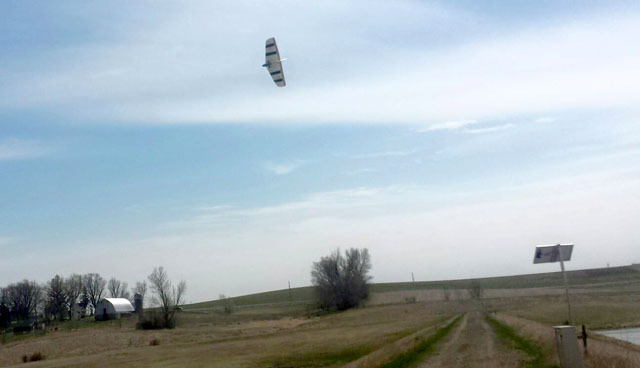 The gusty wind can have the glider crashing into the slope very quickly too, it is challenging flying. Update 1/26/2016 – This webpage was mentioned in Model Aviation magazine Slope Soaring column by Dave Garwood. The small slope flying sites that I have flown the most at were created to hold back a body of water usually part of a flood control project. Having water in front of the slope is good in one aspect as it creates a very flat surface out front void of obstacles to block the wind. It does create the very real danger of crashing into the water, not good for electronics. 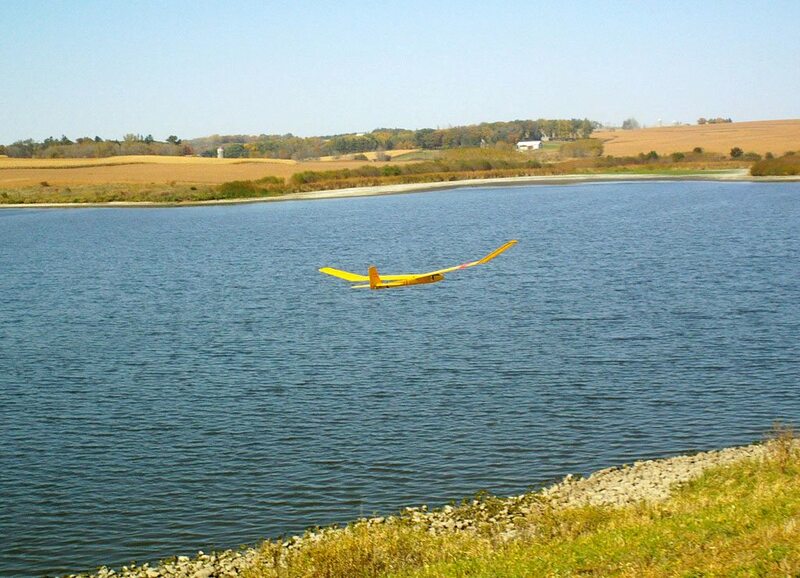 If the water is in front of the slope and the glider is not flying too far out over the water, there is a good chance the wind will blow towards the bank. 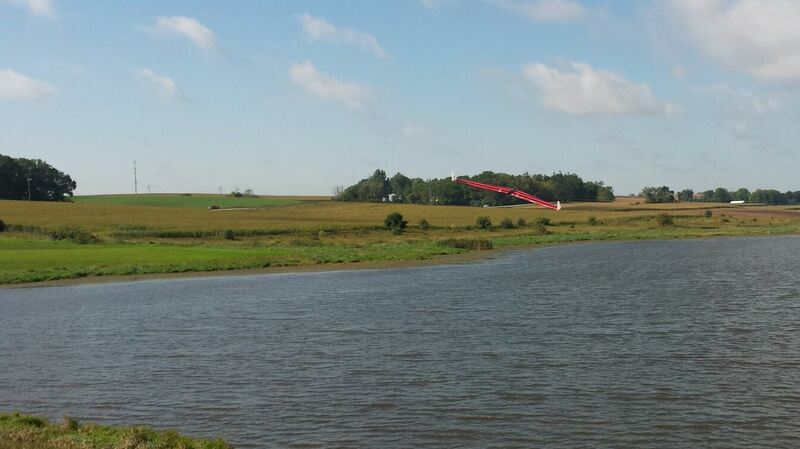 If the water is behind a ridge hill and the glider gets behind the hill, it can be blown into the water in a hurry. Some of the slopes facing have large rocks that can be very damaging to a glider should you land or crash on these rocks. In these situations I have found that having an electric motor available to save the glider from going down in the rocks a good idea. At least be flying a foam glider that is rather crash resistant. I have also flown from a concrete wall that has metal railings above, on most occasions by applying electric power when getting close to the railing I was able to avoid a crash. The gliders I have flown on small slopes have been mainly what I already owned and what I was willing to risk crashing, which were lighter hand launch gliders because with less kinetic energy bad landings or minor crashes usually resulted in no damage. These gliders were normally only rudder and elevator control which didn’t give the quickest control response. 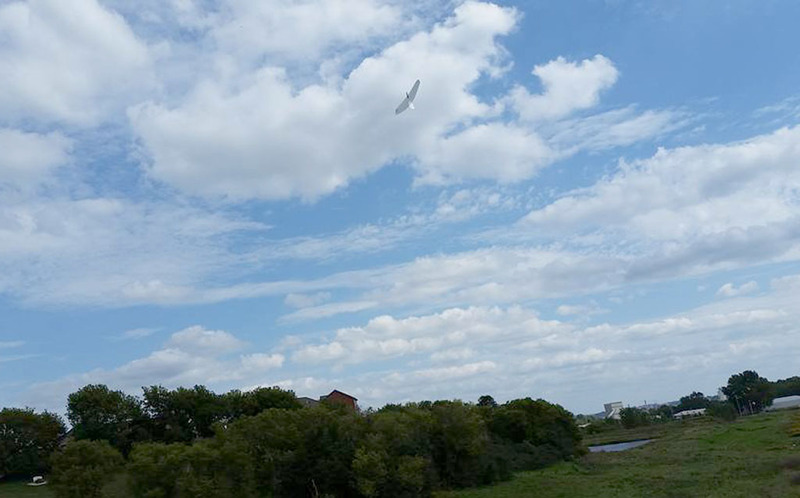 I did fly a Wizard Lite hand launch which had very large ailerons and was great for light lift conditions. 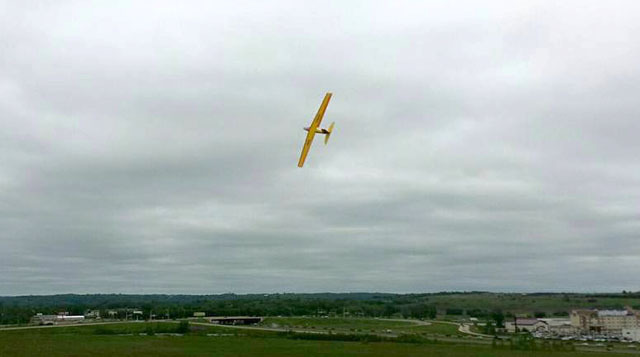 One of my first slope flights was with a large wood two channel glider on a small slope. The glider was staying up pretty well but it could not turn real tight and I was afraid of breaking the glider. If there is plenty of room to fly and land these type of gliders are efficient. Wayne flying Sig 2-meter Riser wood glider on a small slope hoping to make one hour slope task for LSF level 2. Just past the half way mark the glider came down although it had come very close to the ground a couple of times before that. When I saw the Alula flying wing with its’ bird-like look I just thought I needed to buy one. Turns out a friend of mine had purchased one also and we were both flying our pure white gliders at the same time on several occasions. The Alula flew pretty well on a small slope if the wind was in 8 to 12 mph range unballasted. With such a low aspect ratio it is not the most efficient glider. So far I have not been able to climb for very long in thermal lift either. 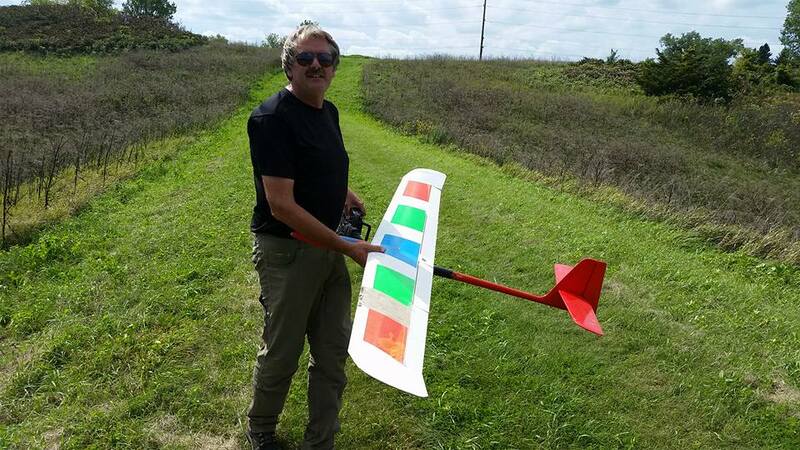 One of the biggest developments to make small slope soaring easy for almost anyone is the availability of the small ready to fly foam gliders. First I would purchase the UMX ASK21 glider from my local hobby shop Everything Hobby Rochester MN. I tried to fly it from the small hi-start included but never had very satisfying thermal flights. On the slope UMX ASK 21 flies really nice and it looks in proportion to the size of a small hill. 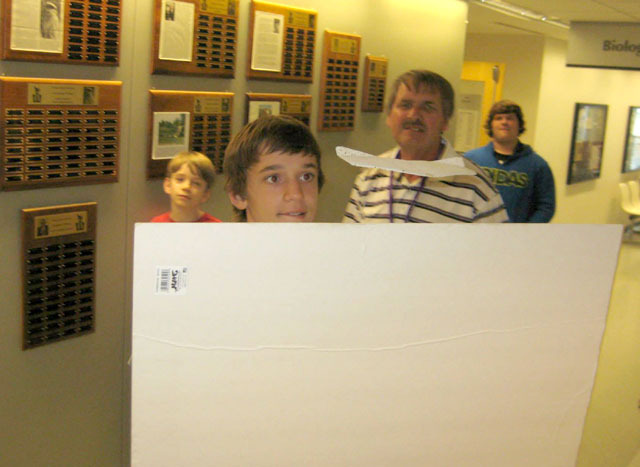 Ailerons give for quick banking. The wing will flex a great deal in stronger wind but it doesn’t seem to hurt anything. The UMX Radian is another foam ready to fly glider that uses a single cell 150 mah lipo battery. This is rudder and elevator with speed control for the electric motor. The propeller folds for less drag and breakage. I have flown the tiny Radian from some really tiny slopes that were rather risky. The lift was pretty good flying from this wall near a river but you had to be constantly correcting as the wind was gusty at times. 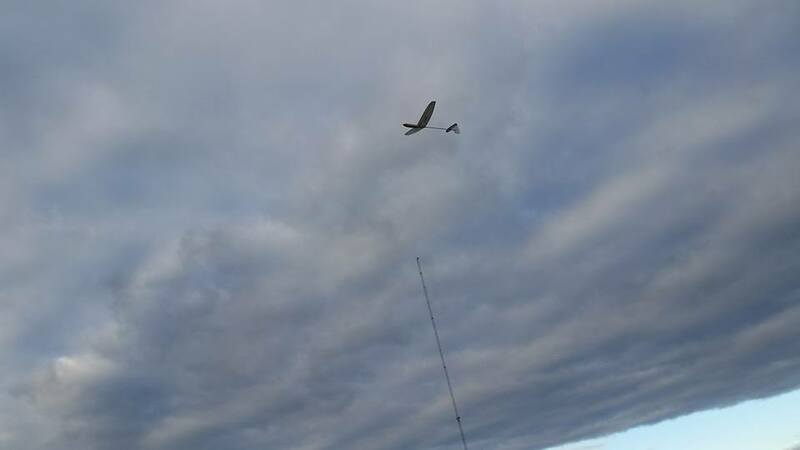 When the glider got too low, I was able to recover to higher altitude and try again. My flights without needing a power boost were over a minute at times. This might not seem like real soaring but it was really challenging for the pilot. My latest tiny RTF glider that flies real well on small slopes is the UMX Whipit. This comes as a Bind-N-Fly so you will need a compatible transmitter. Control is rudder and elevator but it seems very responsive and is able turn in close quarters. Flying from a new slope I discovered but it was really too windy. Flying the same slope with less wind worked well. Video of Flying from this Slope. Whipit flew well from this pile of sand in light wind. 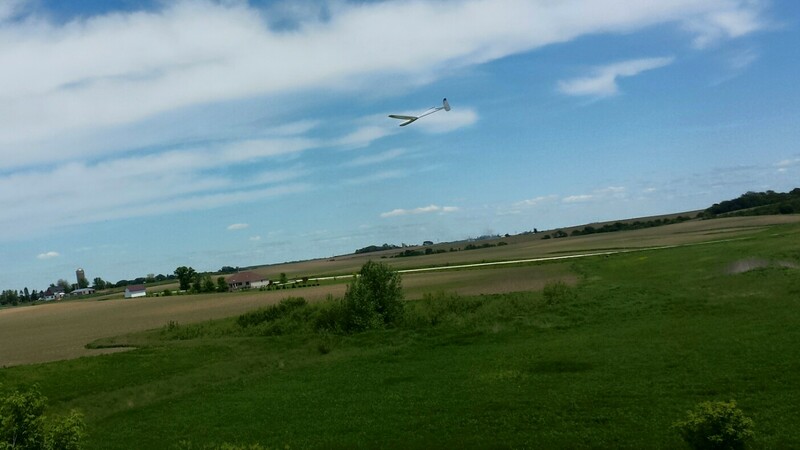 I had the chance to purchase a used Art Hobby Hyper DL discus launch glider and have had a blast flying it for thermal, slope, and dynamic soaring. On the slope it will stay up in lighter wind and when the wind is off more from perpendicular to the slope. In my attempts at dynamic soaring on a small slope, this glider has given me the greatest success in doing consecutive DS laps. My biggest concern is in breaking the glider especially in the tail which is only balsa. 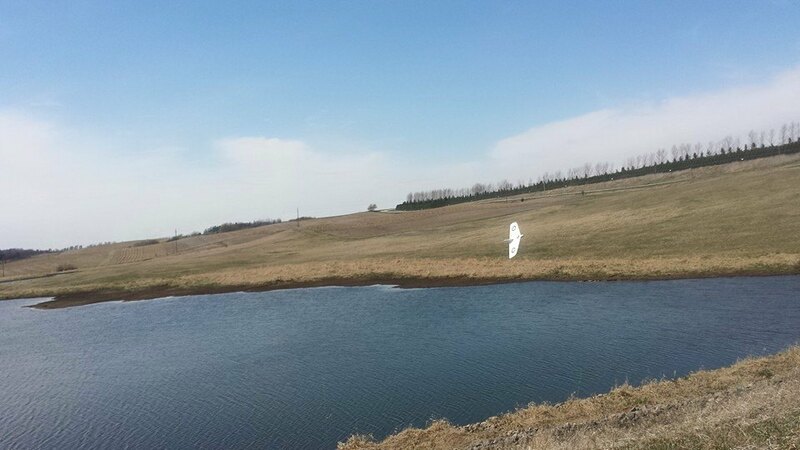 I flew my 2-meter Radian Pro from this small earth dam on one occasion and it flew well. Larger gliders are more efficient. There was a period in time I was slope soaring from some fairly large slopes and purchased a couple of EPP foam gliders from Bowman Hobbies. These gliders were constructed mainly from EPP foam, had heavy carbon rods in the wing for reinforcement, and tail surfaces were coraplast. The foam was sprayed with a spray adhesive and then it was wrapped with filament tape. After that a lower temperature iron-covering was applied. The two planes I have are the 60” JW and the Super Scooter. I also have a 54” span JW that I never built. These gliders flew very well in strong wind from big slopes but I wasn’t sure how they would fly on a smaller slope. 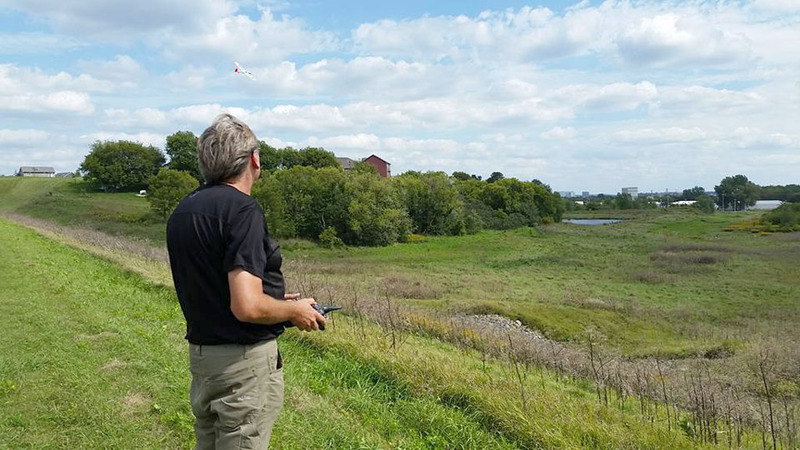 Flying my 60” JW from small hill built from a Bowman Hobbies kit many years ago. The JW was named for soaring legend Joe Wurts after he designed an airfoil that worked well for dynamic soaring built from EPP foam. The first dynamic soaring flights were flown by Pat Bowman. This glider can now be purchased online in several versions from “TheJW” website. My JW doing some DS on a larger slope flown by the designer Pat Bowman. He flew the DS circuits with amazing consistency. My Super Scooter will fly in lighter wind conditions than the JW but on a smaller slope at least 10 mph is needed. These bigger foam planes smooth out the gusty conditions better that are bouncing around the lighter gliders. I have my Super Scooter setup on dual rates, on high rate rolls are really quick. Dynamic Soaring or DS is flying a glider in a circular path behind a slope with a sharp ridge and using the boundary layer of air between the windy and still air to gain energy as the glider passes quickly through on each circle. Some of these small hills had slopes on both sides and I tried making some DS circuits without any luck. After a sharp turn at the bottom of the circuit, the glider just lost all the energy to keep coming back up. One of these slopes had a flat road on top which I found out reduces the efficiency for DS. I kept practicing trying to make circuits on the back side of the hill, just to get more comfortable with diving the glider over the backside of the hill. I even tried electric gliders and adding power to make the circuit upwards along the backside. There was another hill that had a sharper ridge on the top and I thought with a more efficient glider it should be possible to make some DS laps. Finally everything came together, the wind was coming into the hill fairly straight and I had a DLG glider that was much more efficient than my foamie gliders. First I started on a lower portion of the ridge making circuits around the backside of the hill and out into the wind, just to get more comfortable with the process. Soon I moved to the highest part of the ridge and went for making more than a single DS circuit. After getting the glider fairly high on the windy side, I dived it across the top of the ridge down along the backside. This time I did not pull it back as quick as normal but did more of a round circle and the glider came back up the hill shooting upwards with speed. I pulled on the elevator and sent it diving down the backside again; I was really doing the DS circuits now. After a few circuits I let the glider fly over to the wind side maybe I could have kept going but I needed to calm my nerves. 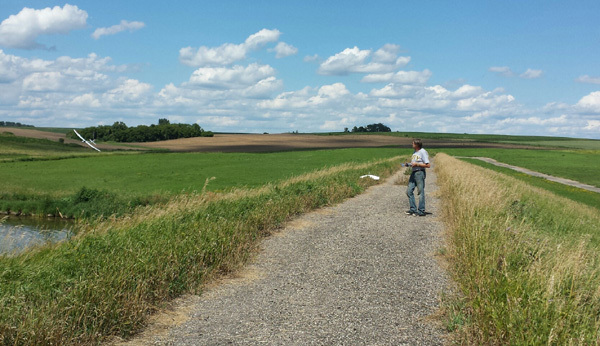 An experienced glider pilot in dynamic soaring came from out of town to join me at this small earth dam slope. He was much braver than me as he was doing the DS circuit next to the water and a rock shoreline. Wind conditions were less than ideal but he did get a few successful DS circuits in. This past Saturday the wind was close to north which blows against the larger portion of this hill which appears to give greater lift. After flying my Super Scooter on the front side enough to get a feel of flying it again, I dived to the backside and made about three DS circuits before having to land because it was out of the proper grove. This was a pretty good start and I felt I could do better. I reduced the aileron throw because I was over controlling at times. All my attempts at DS circuits after this I was always getting at least three circuits but I didn’t seem to do any better than that. On one particular dive over the hill I made an over correction and the glider was on the ground, it occurred to me that I need to get the path for the dive setup on the windy side and then stay off the controls as much as possible as it came across the ridge. With more practice that was working well for me and I was using very little control on the bottom half of the circuit and keeping better speed. Now I made six circuits and the glider appeared to be accelerating at times as it was flying the circuits. My progress hadn’t been linear and I had more attempts with fewer laps but I was building confidence that I could do more. Finally I really had the glider circling in the DS groove, what a thrill this was. I was hoping to make ten laps but as I passed that I was hoping to make at least dozen. It wasn’t to be as after the eleventh lap the glider went off course and landed at the bottom of the hill. Multiplex Dart with ailerons. I finished the Multiplex Dart kit which I had purchased a long time ago; adding ailerons and strengthening the wing with carbon fiber. It will stay up on the slope when my foam gliders will not. I am just starting to DS with this glider and find it much easier to DS than the foam gliders. It goes much faster and retains the energy well. I have a couple of short videos of doing DS with this glider. Using the Art Hobby DL I beat my previous record of consecutive DS laps and came within a half lap of making 50 DS circuits. The wind was rather light but I found it easier to fly without getting bounced around. Some laps were pretty slow and others rather fast. It is getting more comfortable flying close to the ground. Flying with gloves on in 32 F degree weather I again beat previous record for consecutive DS laps. After flying over 100 laps I landed but could have kept going. It seems that one always has to be open to finding new slopes to fly from as old ones become unavailable for various reasons. The primary slope I had been using a couple of years ago now has chain link fencing around it. A friend told me of another slope that was also part of the flood control project but normally has no water around it. It is a fair walk to where you can fly and rather narrow. My friend had tried flying his Ninja before I arrived and cracked the fuselage. Attempts at flying his Alula did not go well. If he added enough ballast to penetrate it would not stay aloft. My attempts at flying the Multiplex Dart did not go well but it turns out one aileron servo was dead. Luckily I brought my Shadow 2 meter glider. Flying a 2 meter glider from this small slope looked scary but I did pretty well with it although I would constantly have to be turning because the slope was so narrow. At one point I had the Shadow rather high and moving fast. There were a lot of weeds or small brush to land in but also an area of rocks at the bottom of the slope. There is another type of slope soaring that is controllable although not radio control. A very lightweight glider stays airborne by riding the deflected air pushed up by the pilot walking with a paddle in front of them. 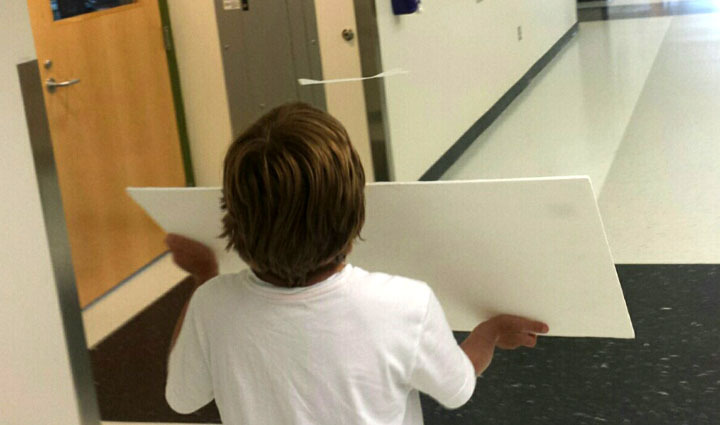 By tilting this paddle slightly in different directions, the glider maybe controlled. Normally this paddle is flat rectangle of cardboard or foam but really experienced pilots have been able to use only their hands. This is sooooo interesting and fascinating. 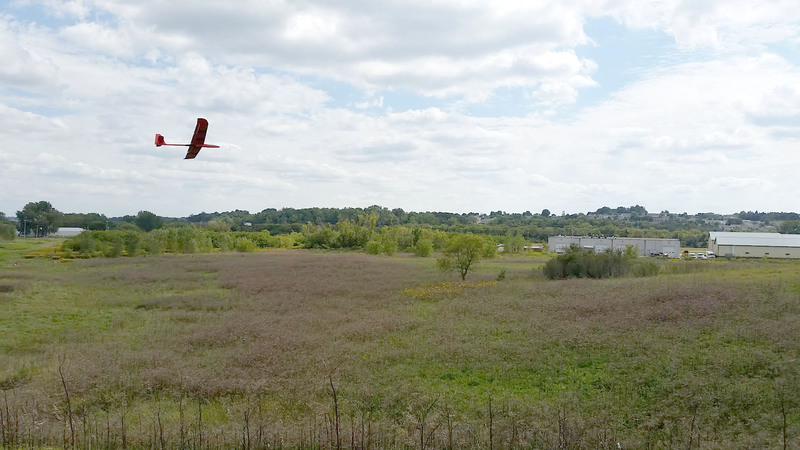 Exactly, what I have been looking for: Exploring your neighborhood for new flying ‘spots’ with small gliders. A bit of skate attitude and a bit of zen. 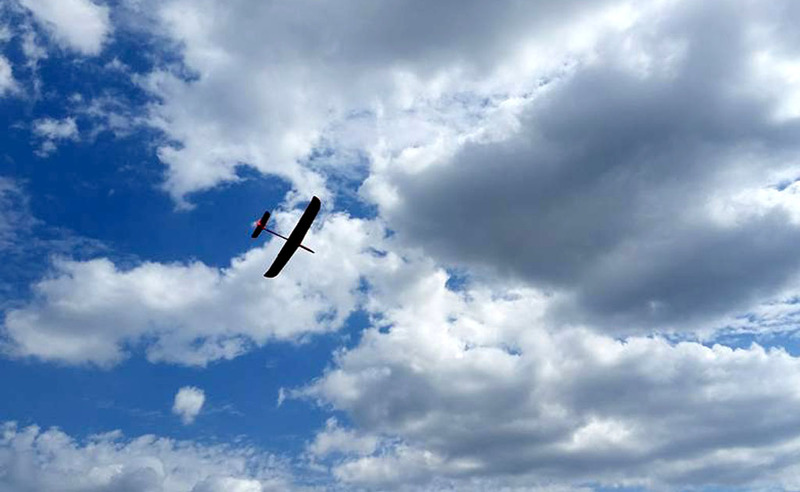 The essence of rc soaring! Dirk, Thank you so much for your comment. I hope people will share some of their small slope adventures in the comments. Really enjoyed reading this Bill! Thanks for the effort! Thanks Fred, I just don’t get a chance right now to get to the bigger slopes right now but I am still having lots of fun slope flying. Wow, I am new to flying gliders but I am hooked. I have a whippit and an Ask21 plus the umx radian…want to learn more about slope flying. Rick, Thank you so much for checking out this webpage and leaving a comment. 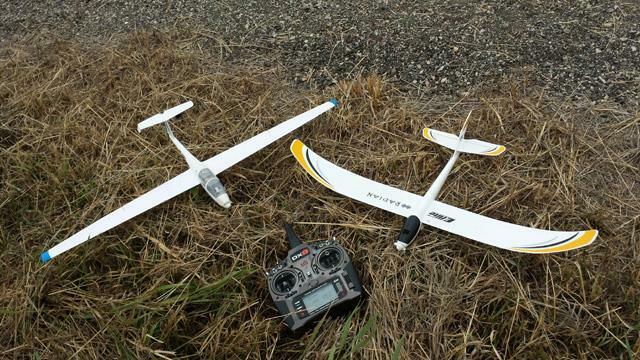 I enjoy flying these small foam gliders both thermal and on the slope. So nice to be able to fly in smaller places than with the larger gliders and have a glider that is more forgiving of hard landings. Great stuff, thanks for sharing. I love slope soaring, it’s you against mother nature, and her being a woman, well, if you win it’s very gratifying. Thank you Frank for commenting. I enjoy thermal flying too but it is sure great to have good flying when the wind blows. Flying the small slopes really helps a person learn to fly really smooth. Thanks for a very inspiring and informative page! This is great! Exactly what I am looking to do. I get that I can check with flood control areas (if we have any) but what about permission? Also, the slopes are so low that it looks like a service road alongside a farm field would also work. Do you just ask the owner for permission to slope on their land? Do you offer to pay for access? Especially small ponds; farms are great sources for these. Offer payment for permission? Just ask? Sorry to be so naive but I’m pretty socially awkward when it comes to this kind of stuff. Thanks so much for any suggestions. I’m a novice sloper with 2 meter foamies, 1.5 meter DLGs, old school bungee launch 2 meter gliders (Spirit, etc.) And a couple of warm liner moldies that I think would be too heavy for this kind of flying. The places that I flew were public land, someone that is the head of our little soaring group did talk to park department about it. After pictures were taken they put up a chain link fence around the slope, even when there was public fishing in the pond behind it. For sure if it is private land ask permission, payment wouldn’t hurt. I hope you can find a slope that works, it is fun when the wind is in the right direction.